Victoria Azarenka and Magdalena Rybarikova also advance to the stage of the final four. 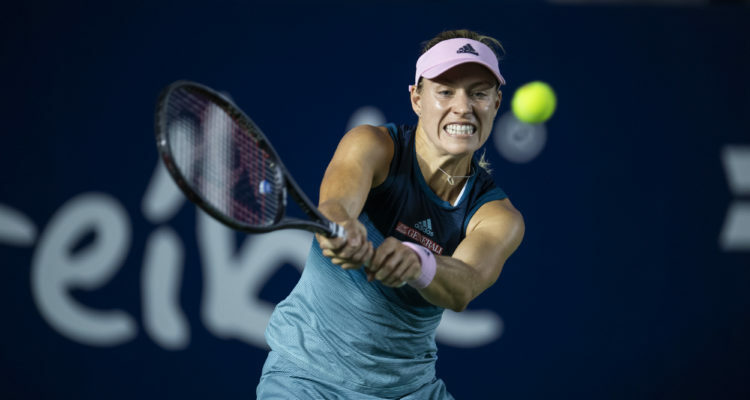 Seventh-seeded Kristina Mladenovic of France entered her Friday afternoon quarterfinal match of the Abierto GNP Seguros in Monterrey, Mexico, having won both of her previous matches against defending champion and former No. 1 Garbiñe Muguruza. Could she go three-for-three and send the defending champion packing for home? No. However, Mladenovic didn’t go down without a fight, either. She saved five match points before losing in a second-set tie break. In their first meeting since the Frenchwoman upset Muguruza in a fourth-round encourter at the 2017 French Open, it was the Spaniard who won, 6-1, 7-6 (5). Muguruza stormed back from a 5-1 deficit in the second set and her four breaks of Mladenovic’s serve were a catalyst. “Being calm, having good tactics and being competitive (was the key today),” Muguruza said during an on-court interview. In the first quarterfinal of the day, No. 8 seed Magdalena Rybarikova of Slovakia, ranked 71st, defeated 134th-ranked Sachia Vickery, 6-4, 6-4, to move into Saturday’s semifinal round against Muguruza. Rybarikova fired eight aces and saved all four of the break points she faced from Vickery. Her two breaks of the American’s serve made a big difference during the one hour and 33 minute match. Kerber won 82 percent of her service points (36 of 44) and lost just eight points on her serve against the 58th-ranked Belgian. The German faced no break points while breaking Flipkens three times in eight tries. She outpointed her opponent 61-44.
.@AngeliqueKerber knocks out Flipkens, 6-2, 6-4! “I feel welcome here, and have a lot of friends and fans in Monterrey. It would mean a lot to win the title, but that’s a long way away,” said Kerber. In the last quarterfinal, No. 5 seed Victoria Azarenka entered against No. 3 seed Anastasia Pavlyuchenkova leading their career head-to-head by a 4-1 margin, but they hadn’t played each other since 2015. While Azarenka was making her Monterrey debut this week, the 33rd-ranked Pavlyuchenkova has enjoyed quite a history at this WTA International event, compiling a 24-2 win-loss record, includuing four titles. Azarenka won 6-0, 6-4 in 68 minutes. “It was a great match and I’m very happy with the level of tennis that I showed today,” Azarenka said after the match, quoted by the WTA website. This entry was posted in WTA Tour News and tagged Abierto GNP Seguros, Angelique Kerber, Monterrey, WTA.